ConceptDraw DIAGRAM is a nature drawings software. Nature solution expands this software possibilities to create beautiful illustrations diagrams with the new library which contains 17 vector objects. Users can use it including samples and templates by adding new library stencils to drawing for creating own illustration. 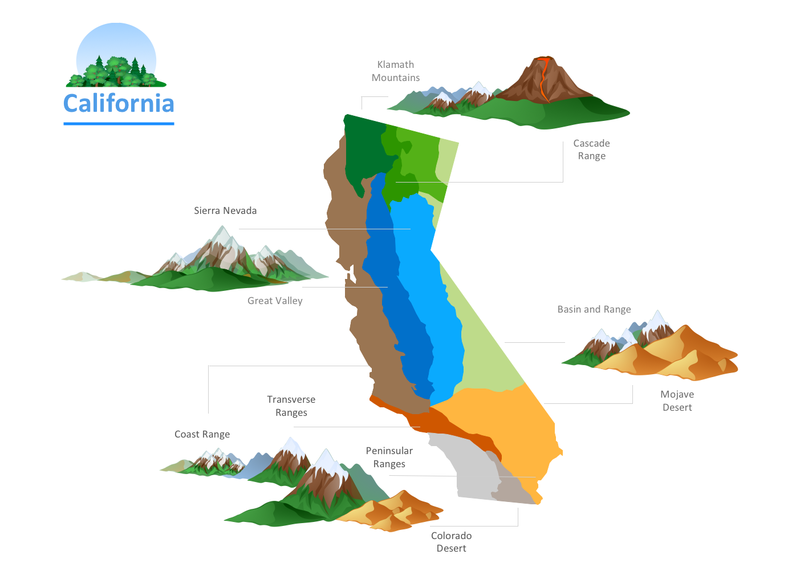 Pic.1 California relief - Infographics. Using Geography library for ConceptDraw DIAGRAM software allows the user to produce professional-looking infographics in seconds. High resolution vector graphics is perfect for presentation needs. This image scales properly for large screens. Nature solution expands ConceptDraw DIAGRAM v12 software with samples, templates and libraries of vector clip art for drawing of Nature illustrations. Use Geography library of vector stencils to draw natural landscapes.